The power of DNASTAR software, wherever you have internet. DNASTAR now has multiple ways for you to take advantage of the power of Amazon Web Services’ Amazon Cloud using DNASTAR software: DNASTAR Cloud Desktop, DNASTAR Cloud Assemblies, and DNASTAR Cloud Data Drive. The DNASTAR Cloud Desktop allows you to access DNASTAR Lasergene software on your laptop or mobile device, anywhere you have an internet connection. The DNASTAR Cloud Desktop runs on the Amazon WorkSpaces application, but the experience is no different from using any DNASTAR Lasergene software on your desktop. DNASTAR Cloud Assemblies is a service accessed through SeqMan NGen that allows you to run and manage NGS assemblies directly on the Cloud. Highlights of DNASTAR Cloud Assemblies include running multiple assemblies simultaneously, viewing the progress of all of your assemblies in a central location, ready access to a wide range of DNASTAR’s genome template packages for utilizing dbSNP, COSMIC, and GERP associations, as well as integration with the rest of Lasergene on your desktop for easy analysis. 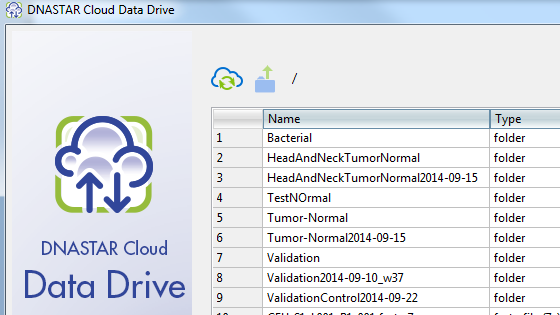 DNASTAR Cloud Data Drive is a secure service that enables you to quickly upload, download, and manage all of your NGS data on the Cloud, saving you time and disk space. For cloud file transfer and for primary or back-up storage of genomic data, the DNASTAR Cloud Data Drive is an economical, rapid-response solution to meet your needs, short- or long-term. DNASTAR Cloud Data Drive is installed with every DNASTAR software license and can be accessed through DNASTAR Navigator. Cloud computing, by its nature, raises concerns about potential security issues. Data security has always been one of DNASTAR’s highest priorities, which is why we have implemented a secure Cloud framework that keeps our users’ data and results safe. DNASTAR uses Amazon Web Services (AWS) as the supporting infrastructure for all our DNASTAR Cloud software applications. AWS’s world-class, highly protected data centers utilize state-of-the-art security monitoring and multi-factor access control systems. The AWS virtual infrastructure has been designed to provide optimum availability while ensuring complete customer privacy and data segregation. AWS has met numerous federal and private security certification requirements, including FedRAMP*. The document below explains, in detail, how DNASTAR builds on the AWS framework to keep your data private and safe, from initial Cloud communications to long-term results storage. If you have further questions about the security of DNASTAR’s Cloud-based applications, please contact DNASTAR’s technical support. * For a complete list of AWS Compliance certifications, including the United States Department of Health and Human Services’ Agency Authority to Operate under the Federal Risk and Authorization Management Program (FedRAMP) see https://aws.amazon.com/compliance.